Please join us May 10th & 11th for our first seedling sale for staple summer crops like tomatoes, eggplant, peppers, herbs, squash, corn, etc. Many heirlooms to choose from and all are GMO-free started in an organic starter mix. We will offer many varieties not commonly grown at big box stores and larger nurseries. You can expect to find 4" pots, 3-packs and 6-packs. Some will contain multiple varieties or single varieties. Plenty of options! All seedlings will be properly hardened off and ready to plant as long as the temperature of the air and soil are warm enough. We will be on-hand to answer any growing questions you may have. This is Mother's Day weekend and a great time to pick up some nice little seedlings for that Mother in your life and for yourselves, because it is always wonderful to treat thyself as well as to give to others. 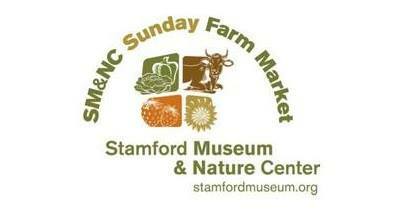 We had such a great time supplying the Stamford community with seasonal, healthy produce, and meeting so many wonderful people that we have decided to participate for a second year at this market! We are excited to bring our fresh picked produce, eggs, and pre-ordered pastured chicken down to you! Please stop by our tent for a chat and pick up some high quality good grown and raised sustainably and with transparency. We will sell seasonal vegetables, herbs, eggs, and will have order forms available for our pastured-poultry operation. We will be happy to meet new customers and reconnect with those from the past seasons. Come down and meet us for chat and grab some fresh and honest food! We are excited to be invited back for our third year at this historic event. Please join us for a day full of food, music, crafts, etc. Stroll around and stop in for some fresh produce! We would enjoy seeing old and new faces alike. We are hosting our first small seedling sale of the season Saturday April 20th from 9am-12pm and again from 3pm-5pm. You can expect to find greens, peas, onions, brassicas, and more. Some varieties are unique, others you may know well. All will be hardened off and ready for your garden. Our farm is small, but what we lack in quantity, we make up in quality. We will be on-site to meet you and chat, and to answer any questions you may have. We have been invited to speak at this event on February 26th at the Wallingford Public Library. There will be a viewing beginning at 6:30pm and we will be sharing our thoughts and our practices with the group post showing. And we will be happy to answer any and all questions at that time. We encourage those who are interested in a more natural and humane approach to raising animals for consumption, as opposed to factory farming, to join in this event. Do not let the title discourage you from coming, it is not as scary as it sounds. Let’s explore different ways to raise/grow food that is safer for the environment, the animals, and the consumers. Join us, along with Rise Yoga of Walingford, and the setting Sun as we say goodbye to Summer and hello to Fall. Let the change of the seasons bring rejuvenate you as Rise Yoga owner, Kelsey, takes you through relaxing poses. Join us as we celebrate the TACO!! We LOVE tacos and are excited to collaborate with Oak Haven Table & Bar in New Haven, providing our fresh produce to fill their authentic tacos. To make a reservation, click below! We are excited to be invited back for our second year at this historic event. Please join us for a day full of food, music, crafts, etc. Stroll around and stop in for some fresh produce! Please join us this season at the Wallingford Garden Market, located at Doolittle Park, across from the YMCA. The market will run June 30th-September 1st, 9am-12pm. Our tent will sell seasonal vegetables, herbs, eggs, and will have order forms available for our pastured-poultry operation. This will be our first year at this market and we are excited to bring our fresh picked produce, and eggs, down to you! Please stop by our tent for a chat and pick up some high quality crops grown sustainably and with transparency. Unfortunately, due to the sale of meat products already at the market, we are unable to sell our pastured chicken. We hope to have a clear and warm day to take in the sights and sounds and smells of Spring. Hawks may be screeching in the background and songbirds will be heard in the surrounding woods. There may be a rare sighting of a hunting Osprey circling the pond on the way back to the ocean, or our resident Kingfisher looking for her prey. Our farm dogs Jada and Sawyer may even wander around curious as to why you're posing like they do. After yoga, we will introduce our farm and our mission, and answer any questions you may have. Please click on the link below for more information and to RVSP. Your payment to attend will be your donation. Spacing is limited so please be aware. Thank you and we hope to see new and old faces! Clean-Up Day on the Farm! We have chatted about hosting a farm cleanup day as we can only do so much by ourselves and figured this would be a great opportunity to have our followers, customers and friends out to the back field to see where we raise our animals and assist us in cleaning up the land from years of abuse. A previous "farmer" (air quotes are seriously needed here) convinced my (Kirsten's) grandfather that the plastic ground cover he used on the property for vegetables was biodegradable and turned it under into the soil instead of pulling it up to trash it. That was over 15 years ago. The plastic is still here in all its glory and has gotten into our pond, woodlots, horse pasture, my folks house, just to name a few. We are very concerned about our pigs and poultry inadvertently consuming the plastic, and for the health of the land. There is also plenty of plastic bottles and other debris thrown around the land from the previous tenant's workers. If you would be interested in attending we would be eternally grateful and will provide you with food and beverages, and a huge smile! The date we have come to agree on is Saturday April 14th with a rain date of Sunday April 15th. If the whole weekend looks like a wash, we will try for the following weekend. These dates should allow for the ground to dry out a bit and also give us the ability to navigate the woods and fields without too much Spring growth. We are thinking the time of the event to start at 930am and run a couple of hours or more, depending what everyone wants to do. If you can only attend for an hour, perfect! You are under no obligation to stay for the duration. We figure lunch will be around 1230-1. Lunch will consist of chicken (shocking), burgers, and some vegetables that wintered over. We will have some beer and wine and non-alcoholic drinks. Please RSVP by April 7th so we can plan the food. Thank you all and we hope to see you there! One day event not to be missed!